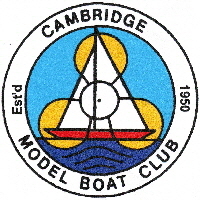 The Club shall be known as the Cambridge Model Boat Club (hereinafter called the Club). The Club shall be governed by a Committee comprising at least three from Chairman, Secretary, Treasurer and Newsletter Editor. A member may undertake more than one role. All shall be elected by an Annual General Meeting and shall serve for a term of one year. Officers may be re-elected for as many terms as they are willing to serve. The Committee may co-opt additional members if required for the current year. If these additional committee members are to continue, they must be elected at the next AGM. Annual General Meeting and Financial Year. The Annual General Meeting of members shall be held in December each year. The Club's year will run from January 1st. Membership Fees should be paid by that date. Junior members, under the age of 18 at the start of the Club year, will pay a reduced membership fee. Members joining from 1st January to 30th June will pay the full fee, those joining from 1st July to 31st December will pay half the full fee. The fee DOES NOT include insurance of models, but does provide Third Party Liability cover. The finances of the Club will be controlled by the Treasurer who is responsible for opening and maintaining an account with a recognised Bank or Building Society. The Treasurer is authorised to raise cheques or use other payment methods to meet the expenses of the club. Full accounts shall be presented to the Annual General Meeting by the Treasurer. At each AGM a member shall be appointed to audit the accounts for the following year before presentation at the AGM. Members agree to abide by the rules contained in this document. Failure to abide by the rules will result in membership being withdrawn. The membership fee permits the member to use the Cawcutts sailing water on Sundays between 10am and 6pm only, Use of Paxton Lakes is not restricted to any day or time. The fee also covers the production, twice a year, of a Newsletter. To minimise our costs, we encourage members to take this in Electronic format, and for this reason we request member's email address. This address will only be used for sending information about club activities and should be no more than one email per month in addition to the Newsletter. The Club has leased from Chivers Farms the rights to sail model boats, except Fast Electric and those powered by an Internal Combustion Engine, on Cawcutt's Lake at Histon. By arrangement with Embryo an Angling organisation we are permitted to sail on Sunday between 10am and 6pm throughout the year, although members usually leave before 1pm. Anglers will also be using the water at this time, and consideration must be given to them. The Club is also a Group Member of Paxton Lakes Sailing Club, Little Paxton, St Neots. There are no restrictions on access to this lake, although a key is required to gain access. Members should never go sailing alone - always arrange to go with another member or a member of your family. All skippers should give due consideration to the safety and enjoyment of other club members using boats on the lake. This is particularly important when using the faster models because of the potential for damage in the event of a collision. At Cawcutts Members are also requested not to congregate at the foot of the concrete ramp and to keep this area free for launching and recovering boats. This also helps to avoid blocking the view of skippers further back from the water's edge. At Paxton Lakes junior members must wear a buoyancy aid at all times near the water whether sailing a boat or not. Members using the Opi dinghy must also wear a buoyancy aid. 1. No boats to be put on the water before 10 am. Please do not arrive at the lake before 9:45 am. 3. High Speed boats to be throttled back, and kept to areas of the lake away from fishermen and other sailors. Please note that the club accepts no responsibility for any loss or damage to members or their property when using the lake, and entry to the lakes constitutes acceptance of this. No IC boats are allowed. Junior members MUST wear buoyancy aids at all times near the water. Members using the rescue dinghy MUST wear a buoyancy aid. The Club shall not be dissolved unless all remaining paid-up members agree to the dissolution. On dissolution the Committee shall dispose of all the Club's assets in the following manner. Any physical assets should be sold. Any funds left after paying expenses shall be distributed as agreed by all remaining members.